The Zoo Authority of Karnataka is registered under Societies Registration Act, 1960, and functioning at Sri Chamarajendra Zoological Garden’s Premises, Mysuru. Upto 20-07-2002 only Mysore Zoo was under the control of Zoo Authority of Karnataka. 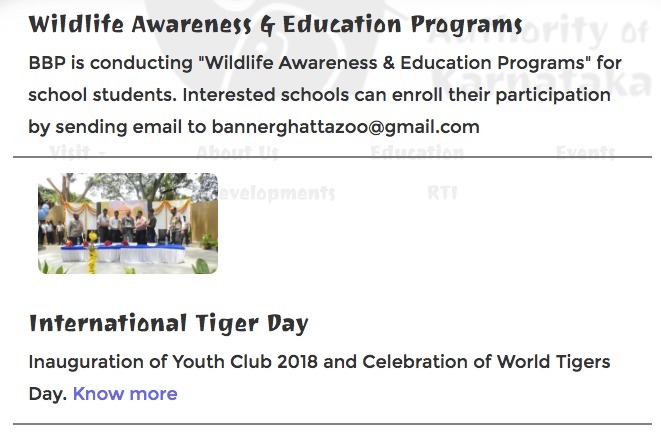 Now, expanded all over the state w.e.f 20th July 2002, with 8 Zoos under its Jurisdiction, Adumalleswara Mini Zoo of Chitradurga is also brought under ZAK w.e.f 18-09-2017. The purpose of establishing of the Zoological Park is for ex-situ conservation of wild animals. To complement and strengthen the national efforts in conservation of the rich biodiversity. Supporting the conservation of endangered species through coordinating breeding under ex-situ conditions. To inspire amongst Zoo visitors empathy for wild animals, an understanding and awareness about the need for conservation of natural resources and for maintaining the ecological balance. To function as rescue centre for orphaned wild animals. Helps in rehabilitation of wild captured, injured and orphaned animals. To serve the cause of Wildlife conservation indirectly by arousing in the people an interest in and concern for wildlife by organizing exhibitions and seminars. To study the habits and behaviour of animals and birds in their natural surroundings as well as in captivity. To conduct research on various problems of the animals in zoos, zoological parks and sanctuaries. Presenting scientific aspects to the public about wildlife management, upkeep and conservation. Providing opportunities for scientific studies. Exchange of animals and birds depending upon requirement in the Zoos. Providing scientific education on conservation of biological lineage. Principal Secretary (Forests) Forest Environment and Ecology Department, Bengaluru. Finance Dept., M.S. Building, 5th Gate,Dr. Ambedkar Veedhi,Bangalore – 560 001.